When I first started studying design, all the foundational guidelines sounded like Greek to me. What is "White Space" and how do I use it? How do I know what fonts to choose?? I can truly say that the best way to learn design is by doing it. This way, you will quickly begin to develop an eye for what works and what doesn't. Many designers can spot those little amateur mistakes from a mile away, so I have compiled a list of 5 things you can change about your design to make them look like a professional did them! All the graphics below were created in Canva. I find that it is an awesome way for faux-fessional designers to create amazing designs, and I wanted to show just what is possible when using this program, as opposed to something more complex like Photoshop. Typography is basically the science of font selection. I can always tell when graphics have been designed by a professional, because they use great fonts, and know how to mix them up correctly. Instead of using typical fonts like Times New Roman or Helvetica, try to incorporate some newer, hotter fonts like Playfair Display, Raleway & Montserrat (examples below.) Choose 1-2 fonts for your branding, and stick with them! If you really want to take things up a notch, mixing fancy script fronts with more readable display fonts really adds variety. Check out a site like dafont.com, which is packed with free script fonts. Make sure you check to check the details on the font, to see if you can use it commercially, otherwise you may have to buy rights to the font. An example of this is my logo, which combines the Signerica font with Montserrat. Another way to get that "designed" look is to increase the spacing between letters. 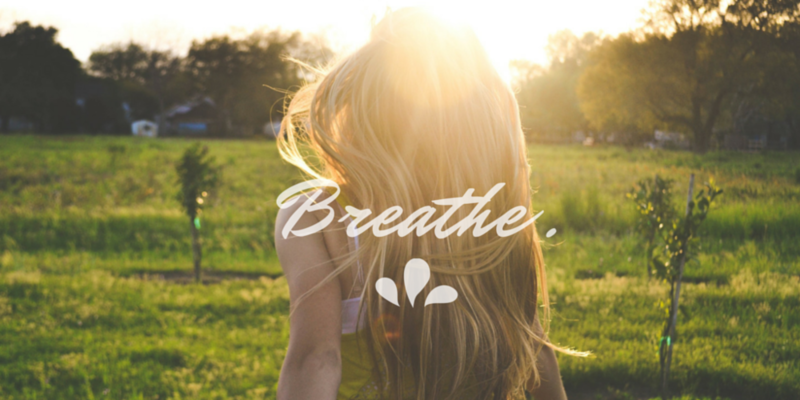 When you allow the words to "breathe" a bit, it creates a more sophisticated, professional look. Opacity is a term for how transparent or "see through" an object is. I have found that colors and shapes can look a little blunt or out of place in my designs, but once I take the opacity or transparency down a bit, things seem to blend right in. If something doesn't feel right in you design, consider adding a shape, and then adjusting the transparency a bit! In the example below, you can see that I took the opacity down to 72%, compared with the other example that is at 100%. Now you are able to see more of the image beneath it, and it all blends nicely! Extra points for the icon, which I'll get into in my next tip! I recommend using icons anywhere you can. They really illustrate the "Call to Action" and they break up the monotony of text. Canva has an awesome selection of icons that you can use as bullets, or as markers for. You could choose one icon that resonates with your brand, and repeat it throughout your design. You'll notice I use the diamond icon for bullets quite often, because it exemplifies the "Luxe" brand that I want to portray. Hierarchy is best described like a story-- most stories have a beginning, middle and end. Some characters and scenes are more important that others, and you can sense that 'pecking order' by the way those stories are told. Similarly with your designs, there should be a hierarchy of what is most important. In a business card, it could be your name or company's name that's most important, then the contact information is next on the list. Social icons may also have a place. 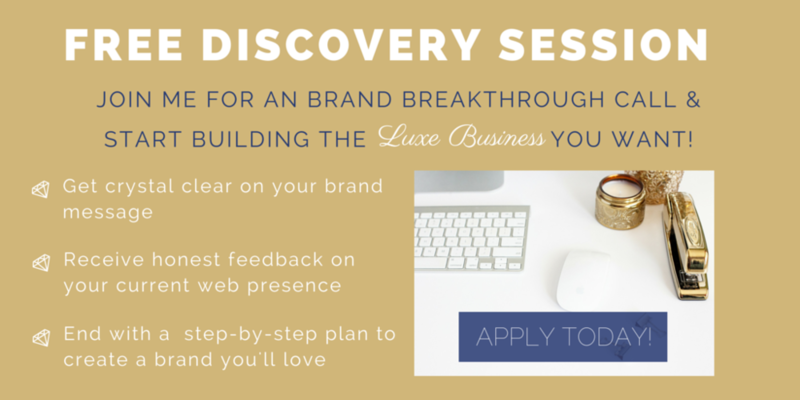 In the example below, I have created a 'call to action' flyer for my Brand Breakthrough Sessions. You see that the Title is most important, so it's larger, followed by a introduction, and then the bullet points-- with diamonds. It ends with a "Call to Action" button the takes up a unique space of its own. Now imagine if this flyer was just a paragraph with all the current text. The eye would only have 1 place to go (the bland paragraph) instead of 4 distinct places. Always be looking for ways to add variety, especially in informational posts-- it helps break up any monotony in the message you're trying to deliver. White space is not necessarily "white" all the time, but it refers to the empty space in your design-- not taken up by words or icons. In fashion, have you ever heard the advice "take off one accessory before you leave the house!" This is also true in design. On your first draft, you are probably taking up too much space, and it's wise to take one thing out of your design. Maybe reduce the font sizes, or just take out an icon. Always be conscious of that space, and allow your designs to breathe a little more! I hope these 5 tips will help you on the way to creating awesome graphics for yourself. For all my designers: that are your go-to guidelines when you are putting graphics together?